As spring nears, the dogwoods and redwoods begin to bloom. The Eastern wild turkey senses the change and begins to make preparations for securing a harem that he will call his own for the mating season. While he has begun to refine his gobbling and practice his strutting, we here at Leavellwood have already prepared for the hunting season by preparing a forest floor rich in natural food sources. Through the practice of control burning our timber land, this has allowed for better visibility while at the same time promoting a better food source for the turkeys. Bugs, young plant vegetation and seeds are all delicacies to the eastern wild turkey. The abundant prairie fields, pine timber and hardwoods all make excellent habitat for hens to raise their young. 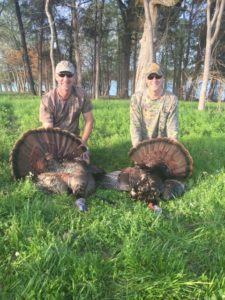 Over the years we have acquired a large turkey population through choosing to harvest only a limited number of long beards each year. In addition, we provide our turkey population with a variety of added food sources such as planted chufas and other grains. Predator control is a year round commitment here and this has greatly reduced the number of potential casualties to our young turkey population and nesting hens. Your morning hunt will consist of a one to one hunter- guide ratio. Our guides are seasoned and knowledgeable in the art of calling wild turkeys. They know the lay of the land and where your best opportunity is for securing that big gobbler. After lunch at the lodge, you are provided the opportunity to bass fish on our lakes located right here on the property. What a chance of a lifetime to kill a long beard and potentially catch a 10 pound bass all in one day. In April of 2006, a new state record was acquired here at Leavellwood. Frank Silvey of Decatur, Alabama killed the new record tom, with a bow, that scored impressively enough to shatter the former record that had been held for many years.